I think everyone has experienced the increased levels of traffic in Castleknock village in the last few months. 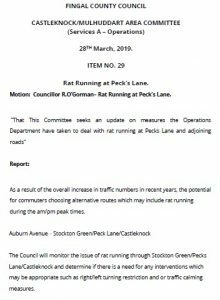 I’ve been speaking to residents living in the area and they have highlighted an increase in rat-running along Stockton Green, Pecks Lane and Hadleigh Court, due to the heavy traffic at the Auburn Avenue – Castleknock Road junction. I brought up this issue with the Fingal Traffic Engineer as a motion at a recent Fingal County Council meeting. 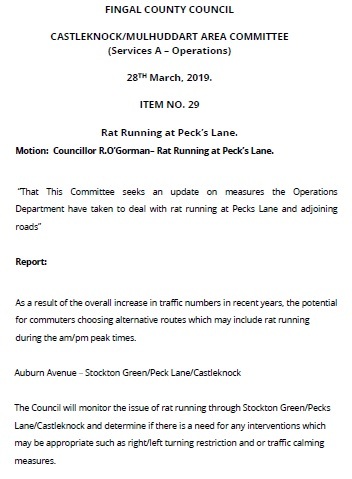 He has committed to monitoring the situation along these roads, with the view to bringing back a proposal to the councillors about how to address the issue within the estate (see report attached). You can watch the discussion of this online here – from 1:19:30 (the quality isn’t great to be honest). I also flagged concerns about motorists breaking the red lights at the Auburn Avenue – Castleknock Road junction. The Traffic Engineer committed to raising the enforcement of those lights with the Gardai. I’ll follow up on this matter with the Traffic Engineer, once he bring some proposals back to the Council.